MuMETAL® Foil is used primarily in low intensity fields where the highest attenuation, highest initial permeability µ (Mu) and highest shielding efficiency are desired. MuMETAL® Foil is fully annealed and available in stock gauges from 0.002″ to 0.010″ thickness [0.05 mm to 0.25 mm] . Foils can be slit to a minimum width of 1/4″ (6.35 mm). Foil width tolerance is ±0.010″ (0.25 mm). Because we offer so many different materials, of different widths, the easiest way to order rolled goods is by sprecifying how long the piece of material will be. 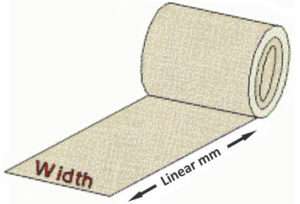 We describe the lengh of the material purchased in linear mm. So, for example, if you order 22 linear mm of a material, you will get a piece that is 22 mm long x the width of the material. The width of each material is listed near the end of the product description. Various Thickness from 0.025 mm onwards are available in ready stock. All material is in Coil form and sheet form!